Taylor Kissinger set a school record by connecting on all six of her three-point attempts on her way to a team-high 22 points, shooting Nebraska to an 87-64 win over USC Upstate on Sunday at Pinnacle Bank Arena. The Big Red maintained a 13-point lead after Kissinger’s fourth three with 6:50 left in the second quarter, before USC Upstate rallied to cut the margin to eight points at 41-33 with 1:30 left in the half. USC Upstate’s Brianna Lewis scored 10 of her 12 first-half points in the second quarter to keep the Spartans within striking distance before the Huskers took a 43-33 lead to halftime. Nebraska got its 11th three of the game on the second triple of the day from senior guard Kristian Hudson to end the scoring in the closing minute. The final 23-point margin was Nebraska’s largest lead of the contest. Hudson, who made her first start as a Husker in place of junior guard Hannah Whitish, finished with six points and three assists. Whitish played 16 minutes in the game but had her streak of 50 straight starts come to an end. 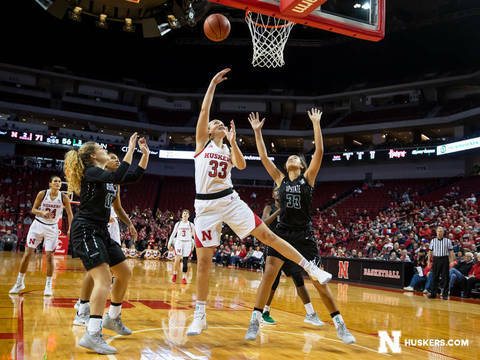 She missed significant practice time the past three days while nursing a minor leg injury that occurred in the first half of Nebraska’s season-opening loss to Drake on Wednesday, Nov. 10. Whitish did not score Sunday, but did dish out four assists.